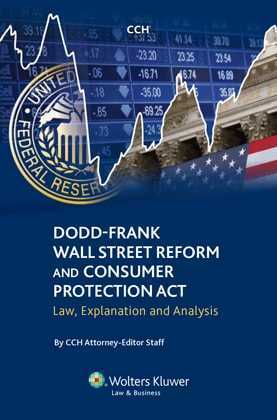 Dodd-Frank Wall Street Reform and Consumer Protection Act: Law, Explanation and Analysis provides comprehensive analysis of this sweeping new banking and securities legislation. These historic reforms will transform the way banks, hedge funds, credit rating agencies, broker-dealers, investment advisers, accountants, public companies and other financial institutions—and the attorneys who advise these entities—operate. Thus, a comprehensive understanding of these changes will be vital to all participants in the U.S. financial system. This definitive publication provides immediate insight into the impact of the new law. Written by the Wolters Kluwer Editorial Staff of banking and securities attorneys, the 1,600-plus page book explains every provision of this complex legislation, providing over 600 pages of the analysis you need to understand the impact of this historic legislation. Commentary includes discussion of the relevant legislative history, including committee reports and floor remarks, detailed citations to new and amended law sections, and editorial comments and caution notes. This publication also features the full text of the legislation and committee reports, tables of effective dates and statutes amended, and a topical index. Make sure you are prepared for this historic legislation with this comprehensive and timely publication.